Yes yes, it’s really me! I am back in action after a very hectic few weeks. We have been away travelling and then have had numerous guests to stay, so I am very pleased to be back in action and starting to resume normal life again. When I say normal, obviously I mean our usual busy with work, puppies, kittens and family saga filled selves. I have been sticking to my new years resolutions which is a first. I vowed to fill empty time with being productive and it seems to be working. I haven’t sat down or stayed still for literally more than a few minutes and am starting to conquer my long ‘To Do’ list that has been growing through out all of last year. And one item on my list for several years has been to learn to drive, guess what? This week I had my first lesson in years. I did learn to drive before but let my permit expire and now have to do the whole thing again. Fingers crossed that I don’t kill any animals or humans in my path during the next few weeks. Today I will write about something I made back in December and have been meaning to blog. When my father was here late last year, he asked for food that smelt amazing and tasted good too. His request was badly received, as to me it implied that my food doesn’t always have good aromas or tastes. However I took this as a challenge to provide him with a meal that would satisfy him fully. I got a beautiful tagine dish for my birthday last year and with the book that came with it, I attempted the almighty Chicken Tagine. And safe to say, it was very well received! The comments made were most welcomed and I think (I hope) I produced a dish that smelt as good as it tasted. I did not stray much from the Le Creuset books recipe. I cannot take credit for this dish but I am excited to share it. Chicken can often be a bit of a gamble. It often is dry or tasteless and this was far from it. It smelt amazing and was succulent and juicy. And is on my list of acceptable dinner party dishes. There is a small issue with a dish like this… I can never find preserved lemons when I need them. I also couldn’t use salt in this dish so I replaced the preserved lemons with my own homegrown lemons that I gently fried with oil for a few minutes to soften. I am very lucky that my father lives in Greece. 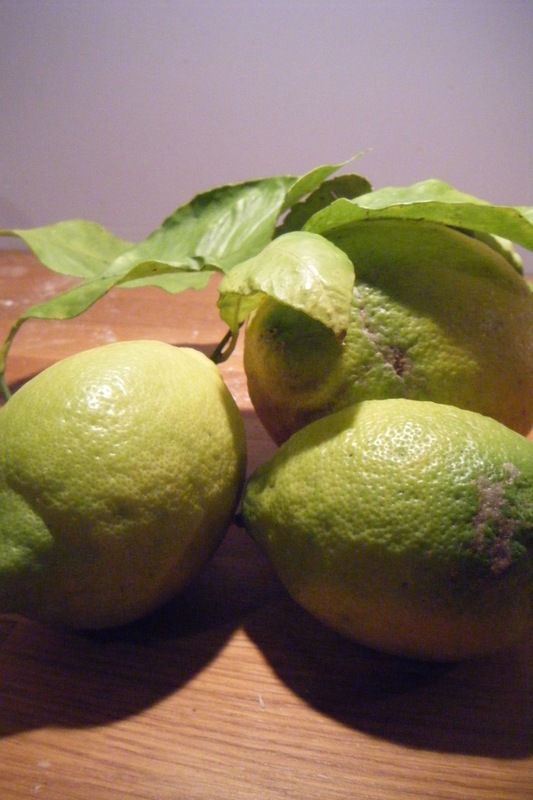 He has many lemon trees in his garden and every time he visits he brings me some lovely big fragrant lemons. I used these here in this dish. To make the marinade, mix all the marinade ingredients in a large dish. Add the chicken thighs and turn them in the marinade so they are well coated. 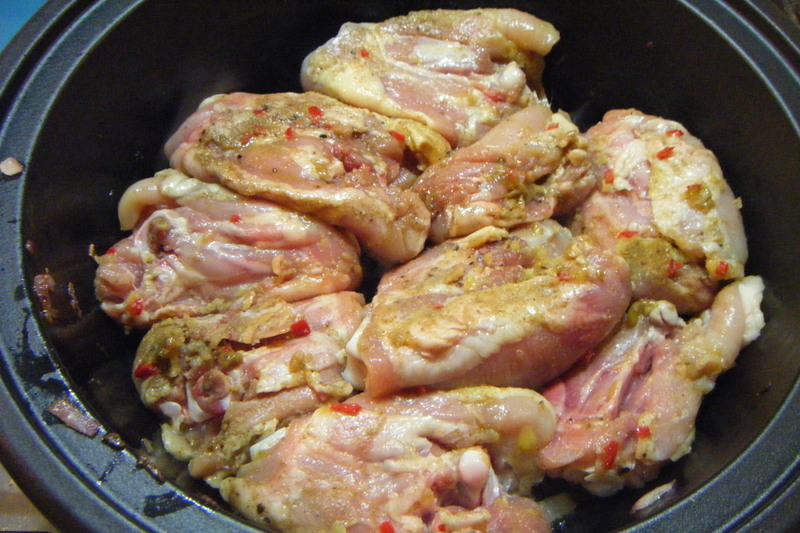 Cover and marinate in the refrigerator for at least 6 hours, or overnight. 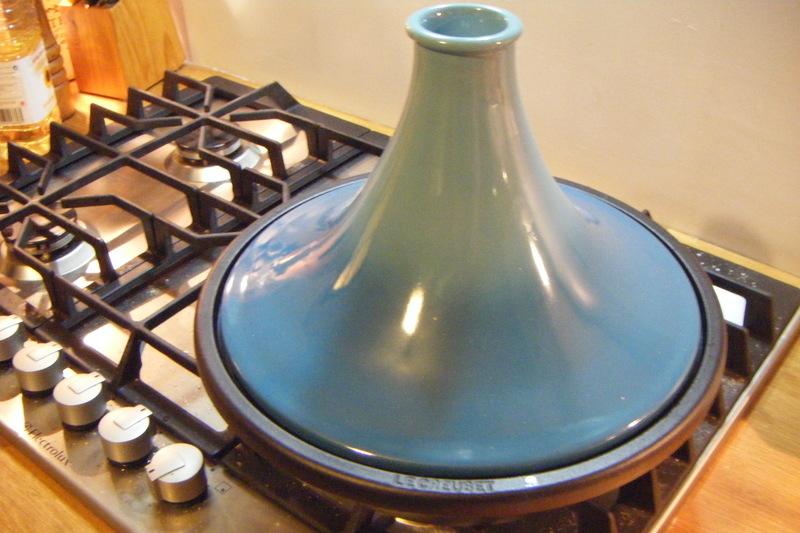 When ready to cook, heat the oil in the tagine base over medium heat on the hob. 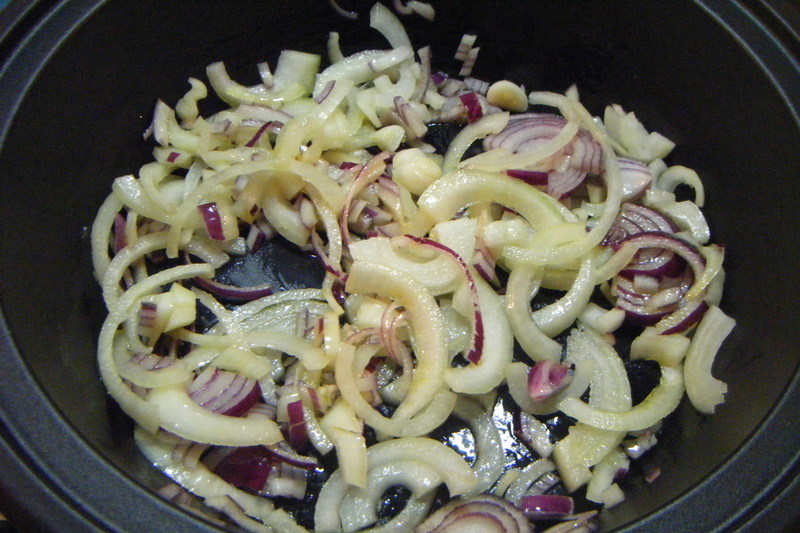 Add the onion and fry gently until it is just beginning to brown; remove from the pan. Drain the chicken, discarding the marinade, and pat dry with paper towels. Add the chicken pieces to the tagine and fry until they are evenly brown turning once. 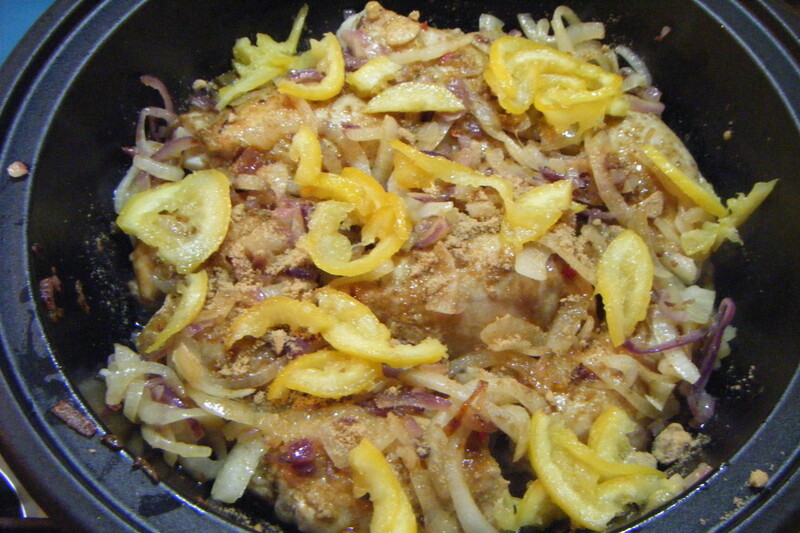 Return the onion to the tagine with the sugar, wine, and preserved lemons (or orange zest). Stir well and add a little more salt and pepper. Cover with the tagine lid and simmer over very low heat for 1.5 hours. 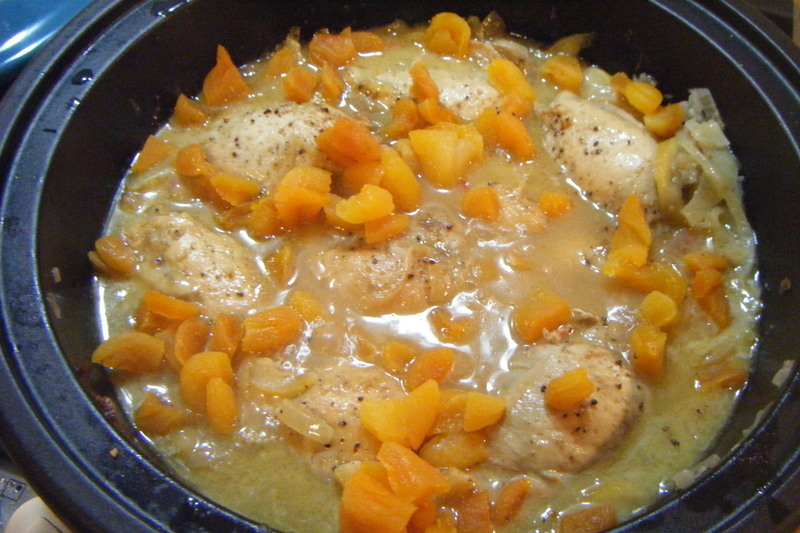 Add the apricots, re–cover, and continue simmering for 1.5 hours until the chicken is cooked through and tender. 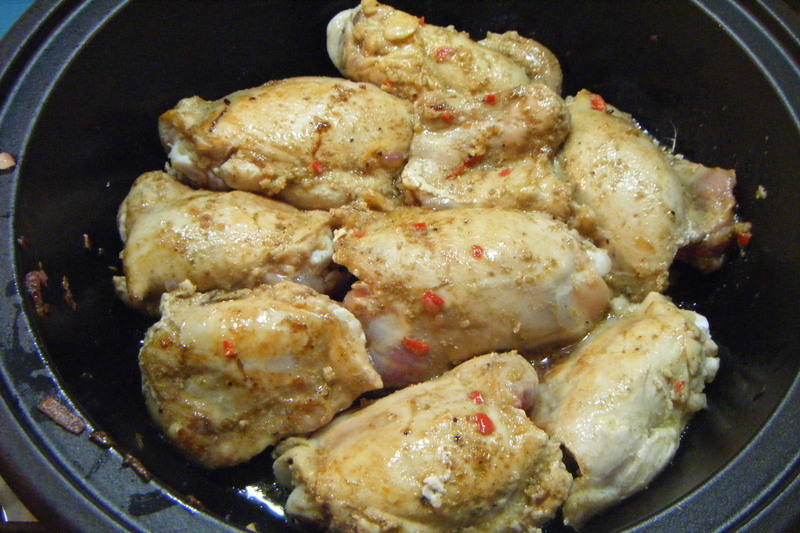 When the chicken is cooked, remove the chicken pieces from the sauce. Leaving the lid off, boil the sauce for a few minutes until it becomes syrupy at this stage if you like it creamier, add 2 tablespoons of natural yogurt. 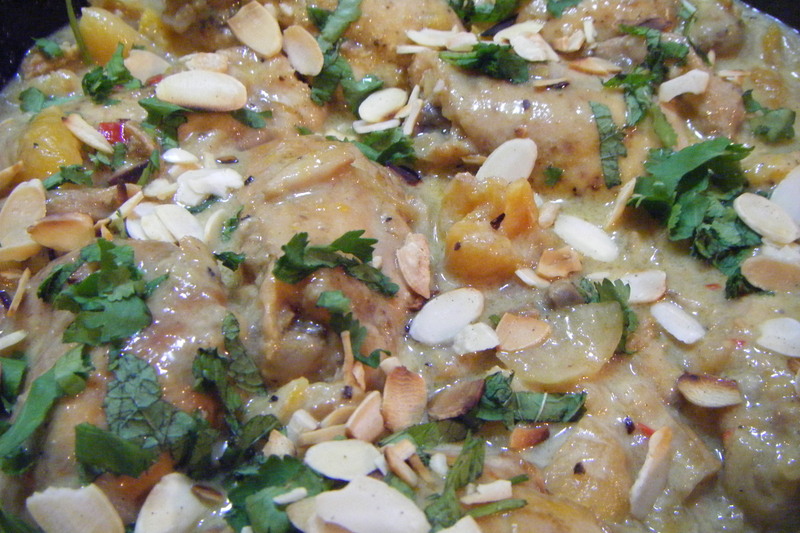 Replace the chicken to the dish and when ready to serve, sprinkle with the coriander and mint and some toasted flaked almonds.